8 Aeros registered for the inaugural Quahog Regatta at Bristol Yacht Club in Bristol, RI. I awoke to drizzle and grey skies, and on the 2.5-hour drive to Bristol encountered nothing that would indicate conditions would be different there. Sure enough, it was wet, gloomy, and water glassy when I arrived. Most of us gamely rigged up—the exception being class wit Derek Stow—and were rewarded with 5 races sailed in light, streaky, but fair conditions. It was so nice seeing new faces! Sally Sharp and Gary Orkney quickly adapted to the Aero and were fast and smart. James Shannon was giving the boat a try for the very first time by sailing in the regatta, and Roy Cooley showed up with his beautifully prepped boat showing off its on-deck outhaul and cunningham take-up systems. 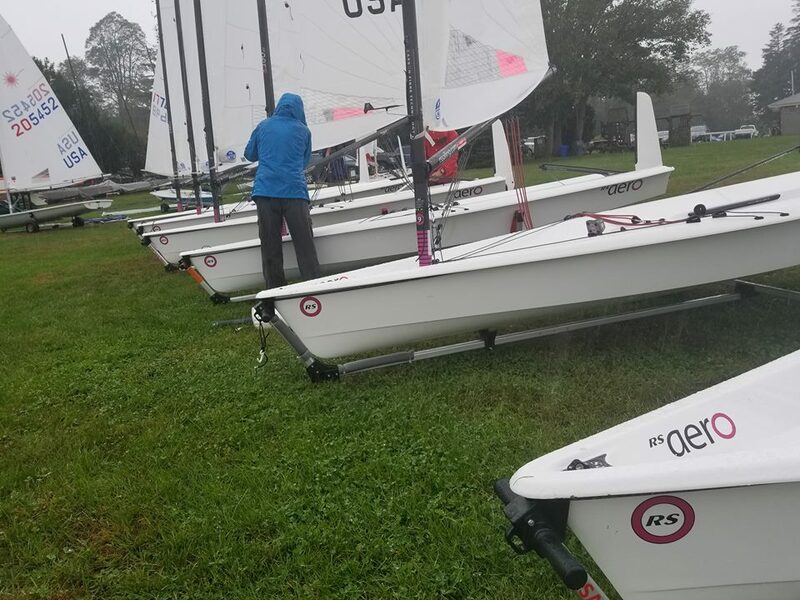 Melissa Solnick drove all the way from New York for the regatta and just pipped Roy to be Top 7 rig and 5th overall, right behind Gary Orkney in 4th. Jim Myers showed marked improvement since his debut at the Hempstead Regatta earlier this summer, winning two races and doing amazingly well in the others for a big guy in light air. A tough last race put paid to his chances of placing higher than 3rd, however. When this guy gets his boathandling down, he’ll be a huge threat. Before racing I offered Sally Sharp the use of a 9 rig and she put it to devastating use, winning 3 races outright and placing 3rd and 4th on the water in the other two. Her starts were often conservative but she had speed and smarts to burn, adroitly playing shifts upwind to the front of the fleet. She really was the star of the day, but fell to 5th in Race 4 on handicap behind the surprisingly fast Melissa in that race. That 5th allowed Marc Jacobi, with all 2nds to eek out a win. Boat handling and downwind pace allowed him to claw back after unimpressive shift-playing upwind. Again, Sally really was the standout of the day. After the last race I thought she won overall, and on the long sail home, she generously shared how she did it. To her, the shifts were visible on the water, and she waited to get in the streaks of pressure before tacking, allowing her to lift up and away in pressure. Classic, light-air strategy, beautifully executed. Well done, Sally! Many thanks to Bristol YC for being such generous, welcoming hosts. The breakfast before, and clam chowder with sandwiches après sailing were most appreciated!